Kirsty & Daniel were recommended to me by Natasha from Hills Celebrant Services (a Wedding Celebrant), as they were looking for a DJ & MC for their wedding day. The words she described for her wedding day was Anchors, Elegant/Beachy, Fun and Upbeat. It was here at the Cleveland Point Lighthouse, that they shared their first date together, so what better place than to share their wedding day with friends & family, by the beach enjoying the surrounding views of the Cleveland Point. Their wedding ceremony was absolutely amazing and everything was just on point! Just across the road from the Lighthouse Restaurant, the guests arrived to the sunny weather onlooking the beach where Daniel was waiting for Kirsty to arrive. With some nice music in the background – it was moments later that Kirsty appeared from down the road in a wonderful Horse & Cart style which I think stopped the whole suburb of Cleveland, and on looking people in the area. It really was quite a stunning entry and was picture perfect. 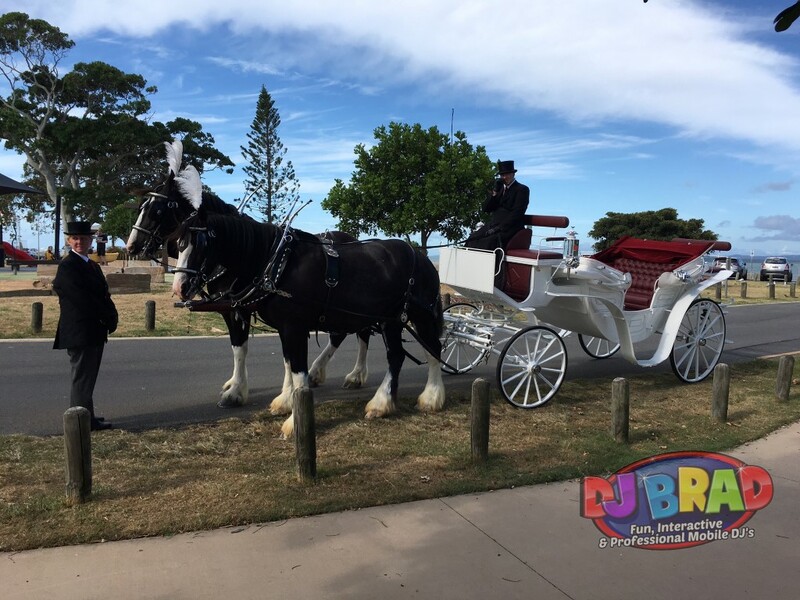 As Kirsty walked down the aisle – there was the kids Tyler (8) & Blake (5) doing a great job at the Ceremony – and Natasha welcomed everyone to the ceremony, and it was time to get married! We had some lovely vowels from a few people and a surprise speech, until they signed the paperwork and officially got married in front of all their guests. Followed by some congratulations, it was time for a few group photos and then guests could make their way over to the Cleveland Point Lighthouse for some drinks. Guests arrived to a scheme of Navy, White, & Silver for color at the Reception, and a BEAUTIFUL view of the water as they enjoyed drinks following the ceremony and then after some light refreshments & canape’s it was time to get everyone seated for the Bridal Party entry, and enjoy a quick welcome to everyone. Guests continued to enjoy the night with lots of conversations, laughter until it was time to Cut the Cake – which was AMAZING by the way – all the little details and touches – lots of people where taking photos….. and then not long after hearing a few words from friends & family. Once the formalities done, Kirsty & Daniel had their First Dance up on the Gazebo, and then guests enjoyed the rest of the night dancing & mingling away.